Last November we told you about the film production of the Big 4 as we had selected some of them for screenings during the Aesthetica Film Festival. 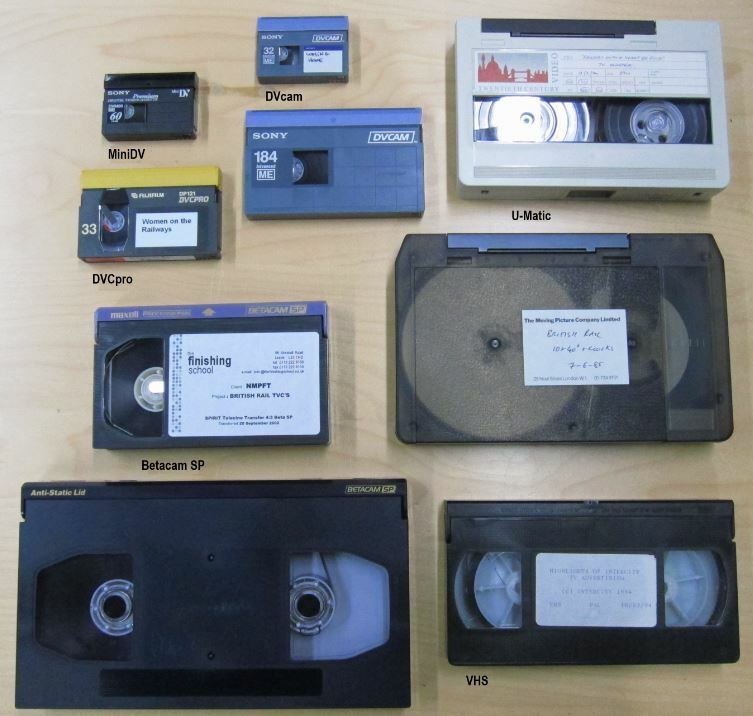 In our collection we have some of these films on 16mm film copies, on video tapes or as digital files. Besides these films produced or sponsored by the Big 4, we hold some original amateur footage, original research footage from British Rail Research and copies of British Transport Films and other productions. Our whole film collection is actually made from various types of format: film, video and digital. 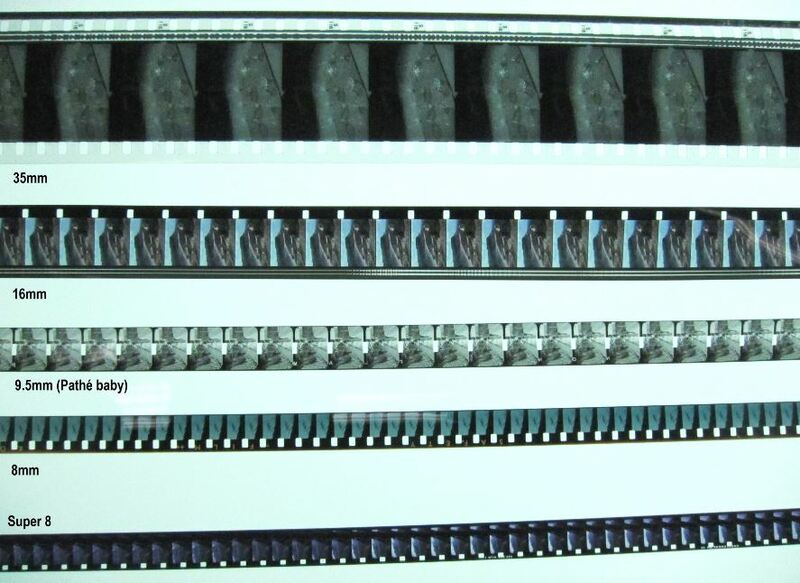 Beyond these there are even more formats: the professional standard 35 mm film, the semi-professional and amateur 16 mm, the substandard 8mm, Super 8, 9.5 mm… For video, there is U-matic, Betacam SP, VHS, Super VHS tapes, etc. Most of the time, each specific format requires its own specific equipment to be played, viewed or projected, and specific ways to be manipulated or taken care of. So, in an archive it is important to know how to recognize them and take care of them accordingly. Today, to talk a bit more about the different formats in a film collection, we are focussing on film with a recent case. We quoted the formats of film we have in our collection, but there are actually even more existing formats, some very peculiar. For example, you may have heard recently of Tarantino’s newest film, “The Hateful Eight”, filmed and meant to be projected on 70 mm film. Already rare in the age of film, this is so rare in the digital age that there is only one 70 mm copy circulating in the UK and only two cinemas showed it, one in London and one in Edinburgh. For film stock, we have to be concerned about the base. Film is fabricated with a chemical concoction involving silver halide and gelatine, forming the emulsion which is applied on a plastic base. The main characteristics for the base are flexibility and transparency. The pioneers of cinematography made their experiments by working on what they already had and knew: photographic film. At the time, the best film base was cellulose nitrate. Nevertheless, nitrate film had one major disadvantage: being highly flammable. An example of a nitrate film from our archive – a Southern Railway Film Unit Production from 1945 ‘Alfred and the Cakes’, a film about the dangers of children trespassing on railway lines. The original negative is held by the BFI. Through the years, inventors came up with alternative solutions. A new base was created, cellulose acetate. This was used for almost all the non-standard films developed around the 1910s and onwards. Most film production studios and cinema theatres did not completely turn to acetate film until the 1950s. Acetate film also named “safety film” offered the advantage of being less hazardous, but was more expensive. It also had always been regarded as performing less well and being of lesser quality compare to nitrate film. The quality of acetate based film was improved by the use of triacetate. With time, acetate turned out to be less efficient in terms of preservation. Indeed, it is subject to the vinegar syndrome. This is a reaction from the acetate film base which causes the acidity level to rise, the base can shrink which can distort or unstick the emulsion causing the loss of a film. When it is decaying acetate releases vapours of acetic acid, which smells like vinegar. As film is a chemical recipe, it implies that from the moment it is fabricated it starts decaying. The role of an archive is to prevent or rather slow down this inevitable decay, especially by storing the films in stable and controlled temperature and humidity. Prevention and proper storage condition are the best tools for film archivists to avoid vinegar syndrome. When it is too late, the process cannot be reversed and the only option left is to make a preservation copy of the film if possible. Non-standard film formats and film production from the 1950’s use acetate. Since the 1980’s films are made on a polyester base, which is very strong and resistant. Unlike nitrate and acetate film that would break in a projector if something went wrong, polyester film would actually break a projector or camera mechanism before breaking itself. According to some studies, polyester is the most reliable film base for preservation . Nitrate, despite the fact that it is highly hazardous, has a good life span when stored in the proper conditions as some of the first films ever made on nitrate film over 120 years ago, are still preserved in film archives today. In comparison, because of the vinegar syndrome, acetate films are not behaving so well. When it comes to polyester, it could theoretically last for 1000 years. The part of our collection that is on film is actually on acetate base. We know it as there are mostly amateur films (mainly 8mm and Super 8 formats), 16 mm copies or originals from late 1950’s to 1990’s. However, a few weeks ago we found a 35 mm film in a parcel with a stamp from 1934. The film is about the Kearney High Speed Railway. It was highly likely that such a film would be on nitrate base. It is important to know for different reasons. Obviously, the first is the hazard involved by nitrate. The physical condition of a nitrate film is important as if it is in a state of advanced decay, it can ignite on its own. In any case it would ignite very easily next to a flame or at high temperature. Another reason is that, even when nitrate is not decaying in a worrying way, the nitrate vapours can still affect other films, and for example accelerate the decay of acetate film. Nitrate films are generally stored separately from other type of films, in highly secured and conditioned stores. In the UK, most of the nitrate film collections are held and stored by the British Film Institute and the Imperial War Museum who have dedicated facilities. 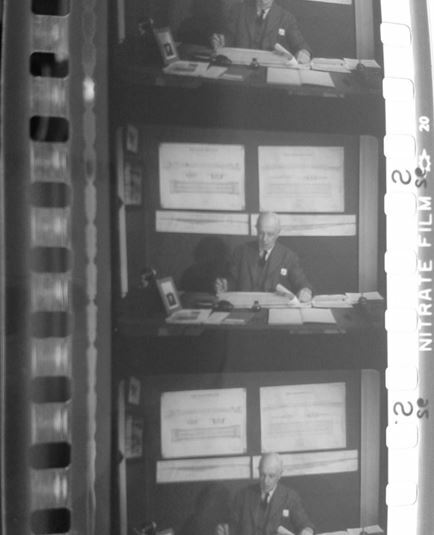 For example, films produced by the former railway companies prior 1948 were made on nitrate films and most of the original nitrates are held by both of these institutions. There are different ways to identify a nitrate base, some with more efficiency than others. Sometimes the word ‘nitrate’ or a blast symbol is actually written or drawn on the edge of the film roll. It can be a good clue but it can be printed from a previous element from which the film you are looking at was made. For example, the film negative could be on nitrate base and you are studying the positive made from this negative, the positive would be on acetate base but the edge would have been printed on it. This is a picture of a 35 mm safety print (acetate base) of the black and white sound film “The Kearney Monorail” (another film about the Kearney Railway). On top of the picture, below the perforation you can see the optical sound track, then the frames, and on the edge below the perforation in the bottom of the picture the printed “Nitrate film” and blast symbol in white on a grey back ground. These were printed on this safety film from a previous nitrate negative element. These pictures are from the nitrate film found in the collection “The Kearney High Speed railway”. You can see that the film is a bit yellow compare to the previous acetate example and quite dirty, also there is no mention of “nitrate” on the film edges. Sometimes another clue is the smell of the film roll. Decaying acetate smells like vinegar. Nitrate can also have a distinctive smell at its first stage of decomposition. Some compare the smell to garbage, camphor, mothballs… and also a slight smell of sweets. 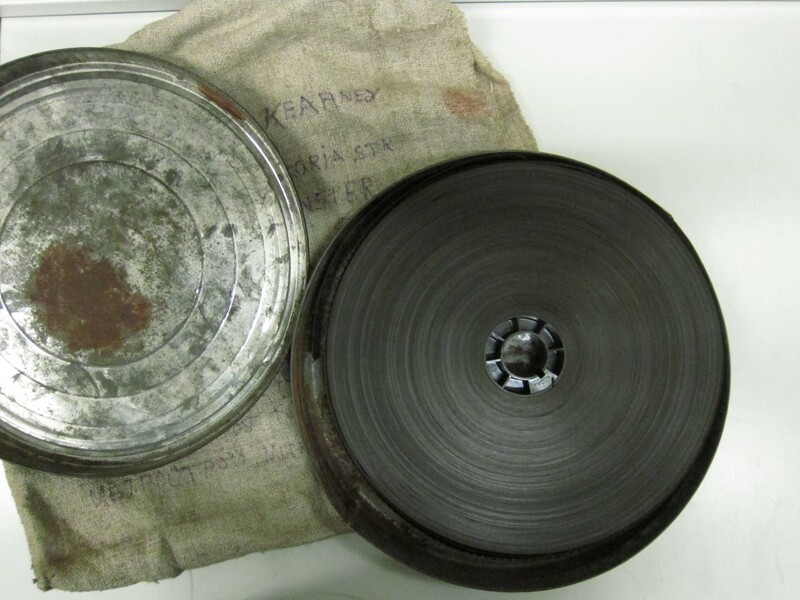 If the film is stored in a metal canister, the condition of the canister can also be a clue. The film we found has the distinctive smell we know of nitrate and the inside of the canister is clearly rusty. When you cannot gather enough clues and you have a doubt whether a film is nitrate, you may have to perform a test on the film. There are two possible tests. The first is called a floatation test. It relies on the density of film bases compare to the density of a solvent, trichloroethylene. In this chemical liquid, each film base will react differently. For this you take a small sample of the film you need to test. Ideally a round sample made with a simple paper punch. You prepare a beaker or a small jar of trichloroethylene to drop the film sample in. In the solvent, acetate would float on the surface. If the sample sinks to the bottom of the beaker, it would be nitrate. Polyester would float around. Nevertheless, this test is not a complete guarantee for identifying a film base. Doubts can still remain even after a floatation test as decay might affect the chemical composition of the base and its density on which is based the success of the test. So we are excited to let you know that we actually have one rare nitrate film in our collection. We don’t know much about the film for now, and we wish to research and gather as much information on it. The film deals with the Kearney High Speed railway and is likely to have been made between the 1910’s and 1930. If you think you have any information on this film, please let us know. To learn more about film process, you can visit the National Media Museum or you can find some specific articles about this topic on its website.